it in 1937. It is the final stage in aerobic oxida­tion. It is also the most significant stage in terms of total energy yield. An equivalent of 12 ATP molecules are formed for each acetyl group oxidized via the cycle. Overall, 38 mole­cules are formed during the complete oxida­tion of a single glucose molecule. The oxida­tion is achieved through aerobic glycolysis and the citric acid cycle. Aerobic means "in the presence of oxygen." 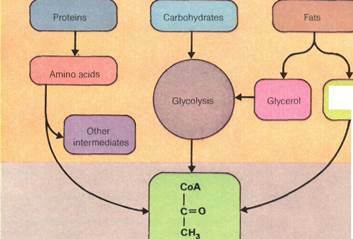 This compares with only two ATP units formed in anaerobic (without oxygen) glycolysis. In this process, a large amount of the total glucose energy remains locked up in the lactic acid or ethanol pro­duced. The citric acid cycle is a highly com­plex sequence of reactions catalyzed by a number of enzymes, all found within the mi­tochondria. It begins with the transfer of the acetyl group to the four-carbon oxaloacetic acid molecule. This produces a six-carbon molecule of citric acid. The citric acid is rearranged to produce isocitric acid. Then, two carbon atoms are se­quentially lost (as carbon dioxide) to form first alpha-oxoglutaric acid and then succinic acid. In both these reactions, hydrogen atoms are transferred to the coenzyme NAD. Three ATP molecules are produced as the hydrogen atoms pass down the mitochondrial respira­tory chain, as previously described. In the sec­ond reaction, a molecule of guanosine triphos­phate (GTP) is made. Like ATP, this is an energy-transferring molecule derived from a purine base, guanine, described in the previ­ous article. The GTP subsequently transfers its end phosphate to ADP, thus making ATP. L-malic acid. Another pair of hydrogen atoms are lost to produce oxaloacetic acid. This leads to the formation of another three ATP mole­cules. The newly formed oxaloacetic acid is then ready to start the cycle again.